The best way to learn shape note is to join in with a local singing. You will be welcome with open arms. It doesn’t matter if you don’t know anything, if you haven’t sung since you were a kid, or that you’ve only ever sung in your shower. You will be welcomed. If you want to practice between singings there are some resources below that we find useful. In shape-note music, notes are printed in shapes that help the reader identify them and their relationship to each other. In the four-shape system used in The Sacred Harp, each of the four shapes is connected to a particular syllable, fa, sol, la, or mi, and these syllables are employed in singing the notes, just as in the more familiar system that uses do, re, mi, etc. This 35 minute video is a recording of the first part of a singing school run by Hugh McGraw in 2009. It’s an excellent introduction to the rudiments or basics underpinning the music. It uses the tunes 49t Old Hundred, 49b Mear , 64 Nashville, 155 Northfield. There are some great online resources to help you learn the principles of shape note singing and songs. These are just some of the resources that we know of and use. 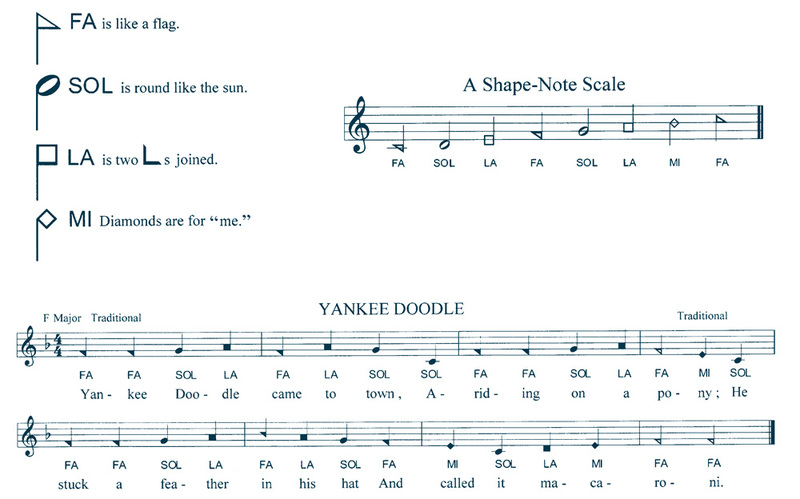 A Beginner’s Guide to Shape-Note Singing by Lisa Grayson is a detailed introduction to shape note and Sacred Harp. The wonderful Bremen singers in Germany have recorded every part of every song. As their website says, the “MP3 examples are computer-generated and therefore sound very odd-man-and not necessarily beautiful”. “Have fun with the ‘singing robot’!” We sure do. This website is a learning resource for both experienced and new shapenote singers. Here you can find free audio .mus files of hymn tunes in 19th century shapenote songbooks, including The Sacred Harp. To play these files, you must download the free Myriad Music Plug-In. This site has a large collection of recordings of Sacred Harp tunes organised by the singing event where the recording was made. There’s also a handy index of the recordings, listed numerically by page number in the Sacred Harp. There are a stack of videos on You Tube of various groups singing Sacred Harp tunes and other traditions of shape note. The Bremen website (link above) has links to You Tube videos with each of the songs listed. Searching Sacred Harp in You Tube will bring up a long list of videos and channels. Also a search using the tune number and/or tune name and ‘sacred harp’ will usually return at least a couple of results. This package of lessons is intended to teach you how to read and sing Sacred Harp music (also known as Shapenote singing). Many generations of young children, people rich in years, and everyone between, have been taught to sing Sacred Harp music using the principles outlined in this package. The author of these lessons is a fifth generation Sacred Harp singer, and has gained much comfort and pleasure from the ability to sing and enjoy this music.